We research and develop software that supports the efficient design and operation of buildings, as well as future systems that can save energy and money. EnergyPlus is a whole-building energy simulation program that engineers, architects and researchers use to model both energy consumption—for heating, cooling, ventilation, lighting and plug and process loads—and water use in buildings. The Modelica Buildings library is a free open-source library with dynamic simulation models for building energy and control systems. We're developing this library to accelerate innovation leading to cost-effective, very low-energy systems for new and existing buildings. The Building Controls Virtual Test Bed is an open-source software environment that allows users to couple different simulation programs for co-simulation, and to couple these programs with actual hardware. 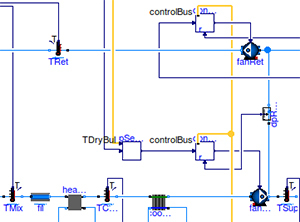 For example, the BCVTB can simulate a whole building in EnergyPlus and the HVAC and control system in Modelica while exchanging data between the two. It can also link these programs to building automation systems and to databases for model-based operation. Once an analyst has specified a problem for a computer simulation, there is usually no time to optimize the design by going through the lengthy process of varying the input data, running the simulation and comparing the various results. 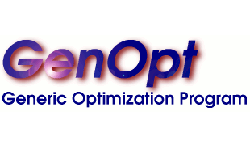 GenOpt, a generic optimization program, helps overcome some of the challenges involved in using system simulation for analyzing complex engineering problems, particularly those related to cost functions. 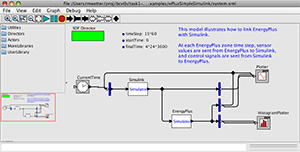 EnergyPlustoFMU can be used to export EnergyPlus data to a Functional Mockup Unit (FMU) for co-simulation. Analysts can model the envelope of a building in EnergyPlus, export the model as an FMU and then link that model with an HVAC system model developed in a system simulation tool such as Modelica. Home Energy Saver is the web's first do-it-yourself home energy audit tool. Millions of people have used it to save energy at home, while trimming energy bills and reducing greenhouse gases. Home Energy Saver was the created by the Lawrence Berkeley National Laboratory for the U.S. Department of Energy. This project was sponsored by the American Recovery and Reinvestment Act (ARRA). Commercial Building Energy Saver (CBES) is a web-based energy retrofit analysis tool for small-to-medium-sized commercial buildings in California. CBES provides energy benchmarking and three levels of retrofit analysis considering the project goal, data availability, and user experience. CBES offers 82 energy conservation measures (ECMs) for lighting, envelope, plug-in equipment, HVAC, and service hot water retrofit upgrades. CBES uses OpenStudio and EnergyPlus to create and run energy models. An extended version CBESPro covers all U.S. climate zones.